In modern society, there are several efficient sewage sludge disposal methods, sludge pressure filtration, sludge thickening, sludge digestion and so on. Using sewage sludge carbonization plant is a new way to handle the sewage sludge. It can reduce the water content of the sewage sludge and sewage sludge in a oxygen-free condition. At the same time, the carbon content will not be affected. So through sludge treatment equipment, the conversion of sludge to energy is possible and eco-friendly. 1. Dry the sewage sludge if the water content is higher than 20%, then put the sewage sludge in the carbonization host, which is heated by LPG fuel. 2. 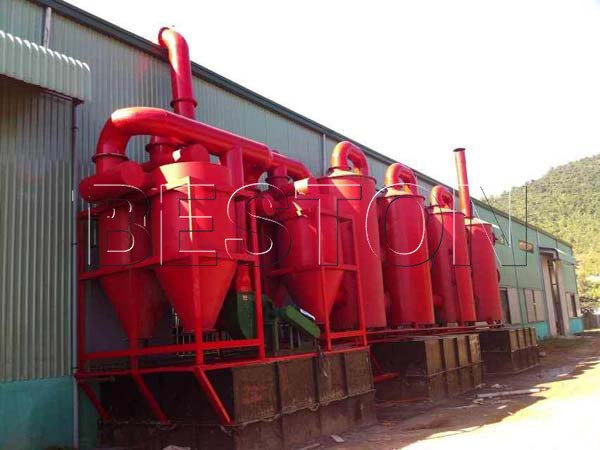 During the sewage sludge carbonizaton process, the combustible gas can be produced. If the amount of the combustible gas is large and steady enough, it can also be the material to heat the carbonization host and possible dryer. 4. Gas cleaner will make gas clean, and you can use the gas to dry the material, which will not pollute the environment. 5. Cooling and discharging conveyor will cool the carbon when discharging. 1. It can handle many kinds of waste, including the sewage sludge, biomass waste and municipal waste. 2. The working efficiency is pretty high, because normally you will get the carbon in 15-20 minutes after the plant starts working. 3. Its service life is 5-8 years, which is also longer than the common than other plants. 4. The design of the heat source can greatly increase the heating efficiency, and the combustible gas produced during the carbonization process can also be recycled to heat the carbonization host. So if you use this plant, you can save a lot of energy cost. In addition, the carbon from sewage sludge is a useful energy in many areas, thus the sludge disposal costs less than you think. 5. It can reach the emission standards, so the plant can both protect the environment and recycle the waste. Moreover, the sealing system and purification system can ensure that there is no secondary pollution during the sludge treatment process. 1. It is equipped with the protecting shell, which aims to protect the operators from being hurt by the high temperature. 2. It can work well under the normal temperature and pressure, so we equip it with a monitoring system to detect the temperature and pressure. 3. We can equip the plant with PLC system according to the special demands of the customers. 4. In addition, the carbon yield rate is 4:1, and if the quality of the raw material is good enough, the carbon yield rate can be 3:1. The sewage sludge consists of organic debris, bacterial cell, inorganic particles and other components, and it also contains a lot of water and organic materials. In addition, it is not easy for the sewage sludge to degenerate, so the sludge treatment and disposal is hard. At the same time, untreated sewage sludge will cause a lot of pollution. Thus the sewage sludge is also a great threat to human beings. However, the sewage sludge carbonization plant can not only solve this problem, but can also turn the sewage sludge into carbon. 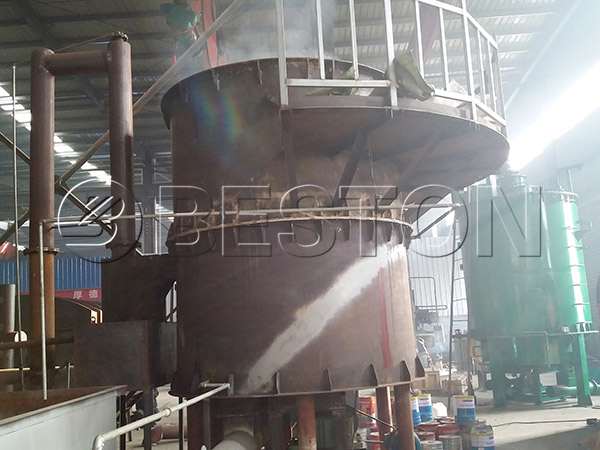 If you want to invest in a charcoal production plant, you can contact us now!